Crockfords Clerical Directory 1898 F J Owens. 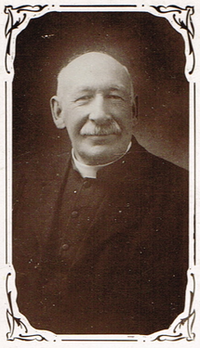 Fred was ordained in 1863 in Manchester becoming Curate in Oswaldtwistle until 1868 then for a year at Swanswick. He was at St Lawrence Chorley from 1869 to 1875 and Curate of St James (taking services in the school) until St James was opened in 1878. He is listed as Vicar of St James from 1878 although the parish was not created until 1879. He died on 18th December 1906 after a short illness and was buried in Wicklow, Ireland. John (apparently known as "Paddy") was ordained in Manchester in 1888. He was Curate of St James New Bury until 1890 when he moved to be Curate of St James until 1906. He then moved to St Cyprian Kirkmanshulme in the parish of St John Longsight. He returned to to be Vicar of St James and was licensed on March 7th 1907 as Perpetual Curate. He left St James in June 1939 and retired to Morecambe. He died 3rd February 1943 aged 84. He was interred in a family vault in Killyman, Northern Ireland. St James became part of the new Diocese of Blackburn when it was established in 1926. Richard Cross (1939) - he left the parish in June 1943 to become Vicar of St Stephen’s Blackburn. John trained at Oak Hill Theological College and was ordained in 1939. He was a Curate in Scarborough then in Mile Cross, then Leicester before becoming Curate at St. James in September 1944. In about July 1945 he became Vicar. In 1951 he moved to Epsom to be a hospital chaplain and from 1955 was serving in Australia and Tasmania. Tom trained at Edinburgh Theological College and was ordained in 1944 as Curate of St John’s Sandylands. He became Curate of St George’s Chorley in 1949 and moved to be Vicar of St. James on 12th July 1951. He moved to St James Blackburn in 1957. Tom retired in 1985 and died in 1998. His wife Ida died in 2013 at the age of 100. Born in 1929, Brian trained at Lincoln theological college and was ordained in 1952. He was Curate at Preston Emmanuel and then at St Thomas St Annes before becoming Vicar of St. James in 1947. 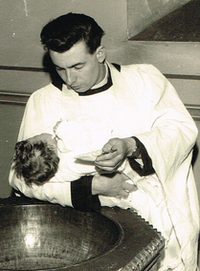 On 5th June 1964 he moved to become Vicar of St Oswald Warton. The new Vicarage on St James Place was built during Mr Oddy's time and he moved in sometime between 1960 and 1962. He retired in 1998 and now lives in Carnforth. Seems to have taken up post in September 1964. He had a double first from Cambridge University. Mr Rowe was apparently taken ill and left on 19th Jan 1967. The website of the parish of Gilling West in North Yorkshire refer to him being instituted there on that date and to his modifications to the then Vicarage later that year. In 1960 he appears to have been in the parish of Harmston in Lincolnshire. It is possible he was born in 1910 in Hull. Eddie trained at Wycliffe Hall, Oxford and was ordained in 1961 as Curate of St Andrew’s Leyland. After a further curacy in Burnley he became Vicar of St James in March 1967. In 1975 he moved to become Vicar of Christ Church, Fulwood (Preston). Sheila Burns died in December 2012. Jack trained at Lichfield theological college and was ordained in 1971. After curacies in Adlington and St. Annes he became Vicar of St. James on 5th March 1976. He moved to become Vicar of Preston Emmanuel in 1982. George trained at Cranmer Hall, Durham and was ordained in 1978 serving as Curate of Highfield, Liverpool. He became Vicar of St. James in 1983 and moved to be Priest-in-Charge of St Gabriel’s Blackburn in 2002. George retired in 2008 and lives in Walton-le-Dale. Ken trained at Oak Hill College, North London he was ordained in 1993 and served as Curate in Leyland, Livesey and Ewood (later Priest-in-Charge). He was Vicar of Saviour Blackburn before coming to St James in 2003. Ken retired at the end of April 2010. David read mathematics at New College, Oxford, worked for London Transport for 5 years, trained for ministry at Cranmer Hall, Durham and was ordained in 1991. He was Curate at St James Carlisle and the Minister-in-Charge of St. Saviour’s Chadderton, Oldham. In 1998 he became General Secretary of Church Society based in Watford, Herts and moved to St James in July 2011. J. Archer - see above - as Curate lived at 10 Canterbury Street. His farwell presentation was on 5th May 1905 and he was licensed as Incumbent of St Cyprian Kirmanshulme on 8th May. George Henry Heaslett - appointed as Curate July 1908, living at 185 Eaves Lane. He was ordained Deacon in 1904 and Priest in 1906 in Wakefield. Curate of Rashcliffe 1904-8. Curate of Leyland September 1910-1912. St Paul’s Preston 1912-15. Chaplain in British Expeditionary Force 1915-19. Dublin 1919-22, Hilsea 1922-23, Gibraltar 1924, Plymouth 1925, Preston 1926-28, Hilsea 1927-29, Egypt 1929-31, Jerusalem from 1931. The latter all imply he remained a Chaplain after WWI. 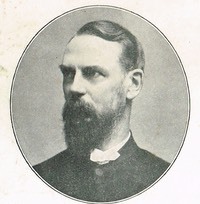 Charles James Crabtree - appointed as Curate late 1910. He had had studied at University College Durham. He was ordained Deacon in 1910 and Priest in 1911 in what was then Manchester Diocese. His father, James Crabtree, was Vicar of Marton. He later became an army chaplain from 1916-20, was Curate of St Mark Preston from 1920-24 and then Vicar of St George’s from 1924. According to the 1911 Census he was aged 23, living at 4 Gordon Street Chorley and was born at Attenborough in Notthinghamshire. He died 10th April 1934. William Evans - appointed Assistant Curate Sep 1917 to 7th August 1919. He obtained at Cambridge BA in 1855 and was ordained Deacon in 1901 and Priest in 1902 to be Curate of Llanllwchhaiarn in the Diocese of St David’s where he served until 1903. St Matthias, Paplar 1903-05, St Peter Lower Edmonton 1905-07, Christ Church Reading 1907-08, St Paul Bristol 1908-10, Chaplain of St David’s Welsh Chapel, Manchester 1910-17. After St James he became Vicar of Mynachlogddu, St David’s. Crockfords does not list what he did between 1919 and 1927. Alfred Henry Eardley - apointed Curate 18 Dec 1921 - living at 32 Canterbury Street. He was ordained Deacon in 1921 and Priest in 1923 when the parish was in Manchester Diocese. He left in later 1924 to become a Curate at St John’s Leyland until 1927. He was at St Paul’s, St Albans from 1927-28. Rector of St. Catherine Collyhurst (Manchester) 1928-31, Vicar of St Ambrose Leyland from 1931. He died 22 Dec 1935 and was buried in Leyland Churchyard. Edward Barrett - appointed Curate 7 August 1933. Moved to St Barnabas, Darwen in mid 1936. He is presumably the same Edward Barrett in the 1932 Crockfords Clerical Directory and was therefore was ordained Deacon in 1930 and Priest in 1931 in Blackburn to be Curate of St Thomas Preston. William (Billy) Bolton (1936-1939) - born in 1905 he trained at Tyndale Hall, Bristol and was ordained in 1933 to St Barnabas, Blackburn. He moved to St James in July 1936. He moved to become Vicar of St Paul Withnell in 1939 and later to the Isle of Man. He retired in 1974 and died in 1996. Norman Maddock (1939-1942) - born in 1915 and trained at St Johns College Durham. He moved to be Curate of Marple All Saints, retired in 1980 and died in 1997. John Cross (1944-1945) - became Curate in September 1944 whilst his brother was Vicar and then himself became Vicar when his brother moved the next summer. Alexander Hamilton Avery Cattanach (1940s) - born 1916 and trained at St Michael’s College Llandaff. Ordained 1939. Retired in 1981 from Little Thorton St John. Died in 1998. John Michael Taylor (1959-1962) - trained at St Aidan’s Birkenhead he moved to become Curate at Broughton. He retired in 1996 and lives in Lytham St Annes. Stephen Wilson Pearce (1962-1964) - born in 1934 and trained at Kings College London he moved to be a Curate in Sheffield. He died in 1997 whilst Rector of the Thornton group.